Jonathan Rea celebrates his record fourth World Superbike title on the podium with his father, Johnny, at Magny-Cours in France. Jonathan Rea says he does not want his ‘incredible journey’ to end after the Northern Ireland rider won the World Superbike title for a record-breaking fourth successive year. 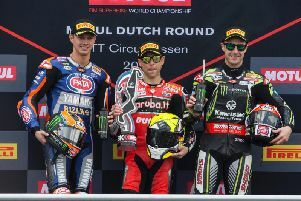 The factory Kawasaki star swept the opposition aside at Magny-Cours in France in race one on Saturday, which was enough to seal the championship after Welsh rider Chaz Davies (Aruba.it Ducati) could only finish fifth. Northern Ireland's Jonathan Rea made it four double victories in a row as he won Sunday's second race at Magny-Cours in France. Rea, who also celebrated his third world championship success at the French circuit in 2017, has now equalled Carl Fogarty’s all-time record of four titles. However, the 31-year-old has achieved the feat in consecutive seasons – an accomplishment that no other rider has managed since the World Superbike Championship was founded in 1988. He also won Sunday’s second race for his eighth win on the bounce and his 68th career success. Newly-crowned champion Rea, who celebrated his title heroics on the rostrum with his father, Johnny – himself a former racer and Isle of Man TT winner – said: “It is absolutely incredible to win four. Sometimes even after winning back-to-back championships, or three in a row, I have to say it is hard to find words to speak about what you have just done. “It is like we are riding the wave now with our Ninja ZX-10RR, with incredible people around me. Whilst I always dreamed of being in this position I never thought it to was realistic. “It was so fitting that Guim (Roda), the team manager, allowed my dad to come and collect the team award on the podium,” he added. “I got really choked up when he came up because it just reminded me of growing up in Northern Ireland and travelling all round with my parents to motocross races, then getting my first pro ride in road racing, and my parents letting go. Rea hailed the togetherness in his team as he once again maximised the strengths of the Kawasaki to dominate from the front. “Pere (Riba) and my team gave me a great bike this weekend and the target was clear. We have been in this position before, so there was no kind of nervousness or anxiety around, it was really positive energy,” he said. Rea also set a new podium record on Sunday of 131 top-three finishes, bettering Aussie Troy Corser’s previous benchmark of 130. The final two championship rounds will be held in Argentina (October 12-14) and Qatar (October 25-27).